Yalta is a popular resort located on the southern coast of the Crimean Peninsula. Clean sea, beautiful nature and plenty of historical attractions attract many tourists. A city with three sides surrounded by mountains. AI-Petri is the highest and perhaps the most picturesque of them. Will take visitors up by cable car, which stretches almost 3 km, by car or on one of the Hiking trails of various difficulty. AI-Petri is located on the territory of Yalta mountain-forest nature reserve and walk in these wonderful places, though tedious, physically, will be a real treat for nature lovers. The summit offers a beautiful view of the city, which lies on the seashore surrounded by green ridges. To get to AI-Petri from Yalta, it is necessary to sit down at the bus station by route taxi №№27 and 32 and go to the stop "cable car". 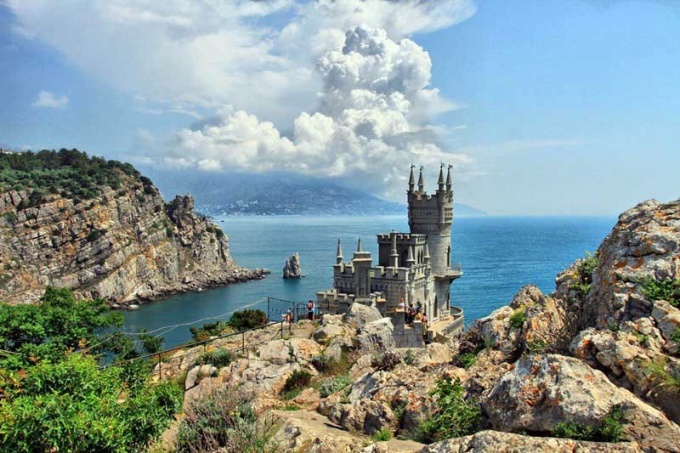 A few kilometers from Yalta, in Gaspra, is giving the famous "swallow's nest" - a fine copy of a Gothic castle built on a rocky cliff of height 40 m. to get to the sights from the bus station by buses № 27 and 30 to the stop "Sanatorium "Parus" or from the promenade on the Danube. One of the main attractions of Yalta – the Livadia Palace, the summer residency of the Imperial family, built in the late XIX century. The building houses the exposition dedicated to the Romanov dynasty and the Yalta conference in 1945. Around the Palace is a Park with fountains, graceful pavilions and sculptures. Livadia beach, to get to which is by lift or on foot, is considered one of the most comfortable on the South coast. The Palace complex is located in the village of Livadia, 3 km from Yalta. You can get there from bus station by route taxi №11. From the Park to the former summer residence of the Grand Dukes, located on mount AI-Todor in Gaspra, leads the Sun trail, a scenic road with a length of about 7 km. This route is also called "Path of health" – so pure and fragrant air, under the canopy of exotic trees, so beautiful the view. The Park is another landmark of Yalta, is to compete with Livadia. It's broken at the foot of AI-Petri, in the village of Alupka. Vorontsov Palace, built in the mid XIX century, belonged to the princes Vorontsov. In the Palace chambers, to preserve the original appearance, there are expositions dedicated to the history of the Crimea and the kind Vorontsov, art and historical exhibitions. Very beautiful Palace of Alexander III, located in the Annex. It is now a Museum dedicated to the history of the Crimea since the mid-nineteenth century to the late twentieth. Around the Palace, as usual, a Park, decorated with fountains and sculptures. To reach it from Yalta by taxi №27 from the stop "Flea-market". Yalta and Alushta – the most popular resort town on the coast of the Crimean Peninsula. It is a universal place for a holiday – they meet the requirements of both fans of active holidays and those who like a more relaxed pastime. What is interesting in Yalta? Mountain AI-Petri is a visiting card of Yalta. 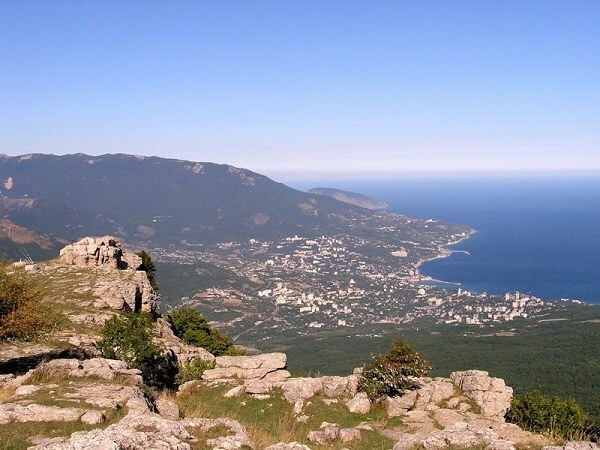 The mountain is located on the territory of Yalta reserve. You can get there several ways: by cable car, by car on a winding road, through the pedestrian paths. The view from the summit offers an unforgettable view of the city. The main attraction of Yalta is considered the Livadia Palace – the summer residence of the Imperial family of the Romanov dynasty. The Palace is surrounded by a beautiful Park with fountains and sculptures. In Yalta you can visit the Massandra Palace, which is also surrounded by a beautiful Park. Here you can get a tasting of famous Crimean wines. The suburbs of Yalta, which is located just a few kilometers from the city, also rich in attractions. In the village of Gaspra is the Sunny path. This scenic route 7 km long, leading from the Park of Livadia Palace to the former summer residence of the Romanov dynasty on the mountain AI-Todor. Walk on this trail will give you a true aesthetic pleasure from the contemplation of natural beauty, and the pure air will give us strength. Lovers of architecture in the same village have the opportunity to visit the cottage swallow's nest. This is a copy of a Gothic castle on a rocky cliff. The Vorontsov Palace with the most luxurious fleet in the Crimea is located in the village of Alupka at the foot of mount AI-Petri. This Palace has a unique architecture. In Koreiz is Yusupov Palace, which has survived several wars and has not suffered from any of them. If you are planning a vacation with children, they will be happy to visit with you Yalta zoo "Glade of fairy tales" and sea aquarium which are next to each other. Also family can visit the Crocodile farm where you will have the opportunity to see large number of crocodiles and their offspring and know a lot about them. Things to do in Alushta? First thing in Alushta to visit the Valley of Ghosts. Stone sculptures created by nature will surely be able to impress. Here at the foot of the mountain Demerdzhi, you can see the fortress Funa. Walking around the city, look in the yard of the house № 15 along the street on 15 April and will see the surviving fragments of the fortress of Aluston, which was built in the VI century. In Alushta can visit the Aquarium, which features more than 250 species of fish. The city is one of the best water parks of Crimea. Water Park "almond grove" has 6 swimming pools, 14 water slides, a Solarium, waterfalls, Jacuzzi, fountains and other attractions. Lovers of outdoor activities should visit the mountain Chater-Dag, which is rich in karst caves. Here you can admire the stalagmites, stalactites and underwater lakes. Do not worry if you do not have enough time to visit all the sights. Should something stay on your next vacation.